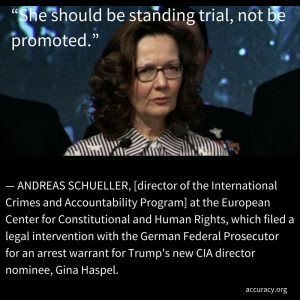 Schüller is director of the International Crimes and Accountability Program at the European Center for Constitutional and Human Rights, which filed a legal intervention with the German Federal Prosecutor for an arrest warrant for Trump’s new CIA director nominee, Gina Haspel. “The Federal Prosecutor did add our criminal complaint against Gina Haspel to his preliminary examination of CIA-torture, which exists since the U.S.-Senate Committee published its executive summary about CIA-detainee treatment in December 2014. “We ask for a joint criminal investigation of the CIA and U.S. Army torture program between 2002 and 2006 by several European states.